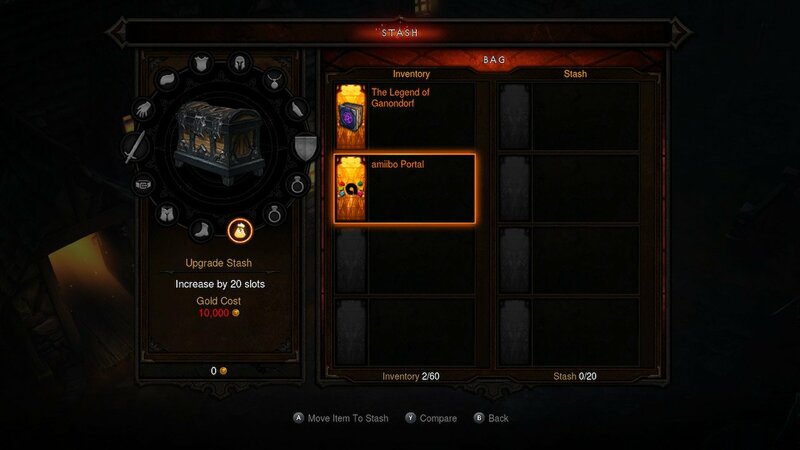 You can now brave the world of Sanctuary in Diablo III Eternal Collection on Nintendo Switch, and, as you set out to battle demonic hordes, you may be wondering how to use amiibo in the genre-defining action RPG. After helping to kill the risen dead that are attacking the gates and entering New Tristram, head towards the Slaughtered Calf Inn and, outside, you will find your Stash – a lone treasure chest that you can use to temporarily store unwanted items and gear. You will find that The Legend of Ganondorf and an amiibo Portal have been stored away, so, first off, move these into your inventory. Once shuffled, open the inventory menu and use the radial wheel to select your bag and then items, where you will find the Legendary Portal Device. All you need to do at this point is press the A Button to use it to summon a kaleidoscopic portal next to your character. You can then scan an amiibo with your Joy-Con or Nintendo Switch Pro Controller that, at this point, will spawn a powerful demon that, once defeated, may reward you with powerful in-game gear. After this, you will need to wait for the 22-hour cooldown to pass before you can scan another amiibo. Version Exclusive Pokémon In Pokémon Let’s Go, Pikachu! And Eevee!